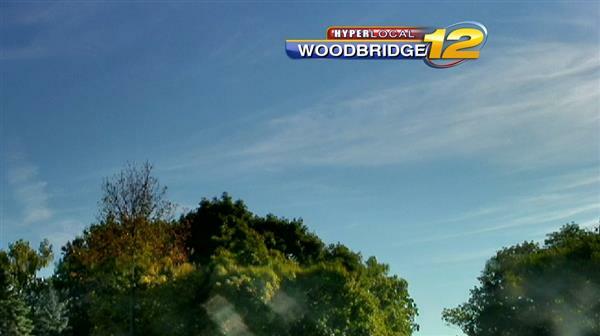 The sky is clear in Woodbridge this morning. It's cool and dry. However, we do need some rain. Just one of the last 12 days --- August 31 --- at Bridgeport has featured any measured rain (0.06"). There will be a good chance of showers and thunderstorms later Saturday afternoon and evening. 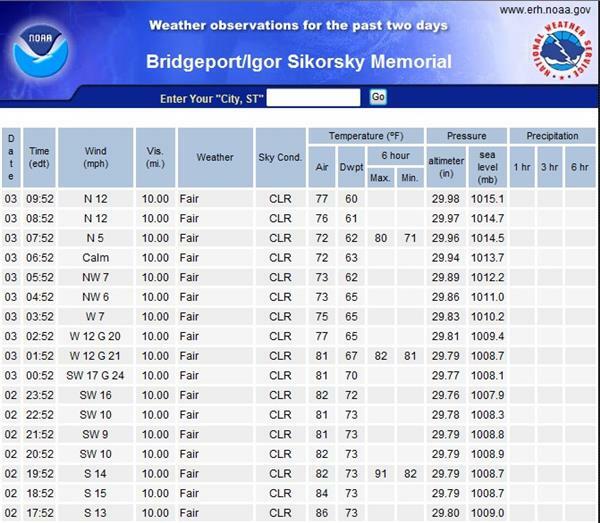 The dew point at Bridgeport has dropped from a very oppressive 72 degrees at midnight to a relatively comfortable 60 degrees this hour. It is certainly less humid outside. 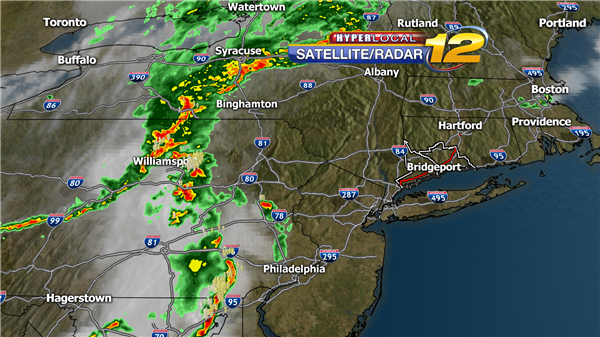 Storms over upstate NY and Central PA will be moving in tonight. 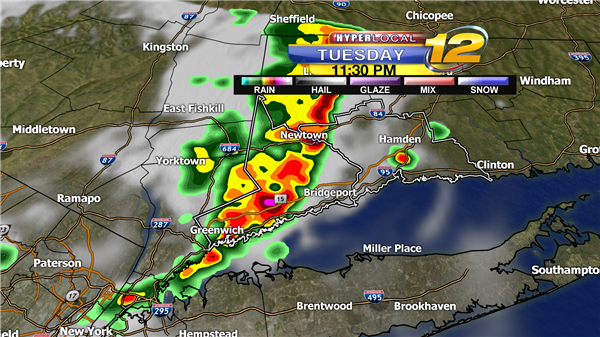 The storms will most likely weaken but still may give heavy rain and lightning. Computer models show a quick round of strong storms tonight. Heavy rain, frequen lightning, and gusty winds will be possible as a squall line rolls through before midnight. We'll keep you updated. Heat index values have been in the mid 90s today with sunshine and a light wind. Tonight the cold front passes with storms ahead of it. An Air Quality Alert is in effect until 10 o'clock this evening for Southern Fairfield County. Heat index values have reached into the 90s late this morning. The length of daylight is getting shorter. 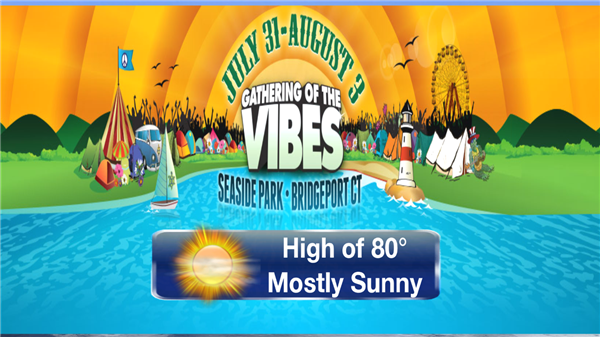 Sunrise at Bridgeport was at 6:20 this morning, and sunset will happen at 7:24 this evening, more than an hour before the latest sunset at 8:30 on the first day of Summer. 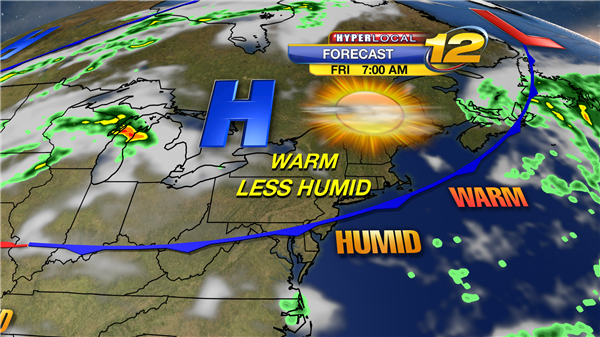 A cold front will push through the region early tonight, delivering less humid conditions later tomorrow. High pressure builds into the region Thursday, but it will still be a warm week with daytime highs in the 80s. Here is the Thursday forecast map. 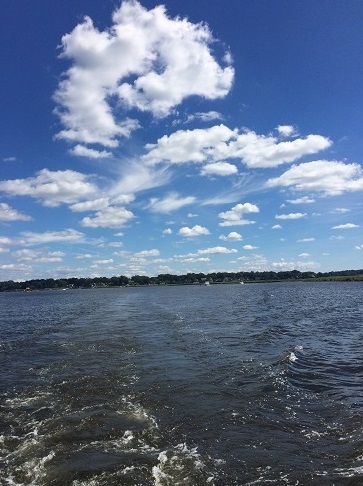 Some fair weather cumulus clouds dot the sky but no rain across the region. 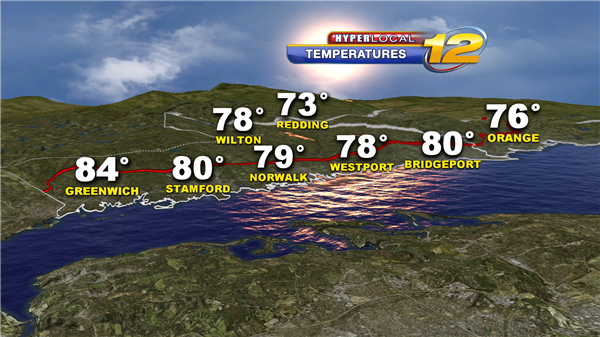 It's much milder than this time yesterday thanks to last night's cool front. Sunshine stays with us for a couple of days before clouds and rain roll in for the end of the weekend. showers and possible thunderstorms through Monday. Tonight: Clear and cool with lows from the mid-50s to low 60s. 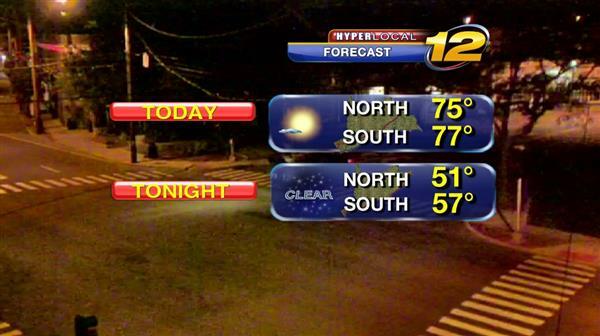 Friday: Sunny and pleasant with highs in the 70s. Friday Night: Partly cloudy, lows from the mid-50s to the mid-60s. Saturday: A mix of sun and clouds with highs in the 70s. showers, low in the 60s. thunderstorms, highs from the mid-70s to low 80s. possible thunderstorms, highs from the mid-70s to low 80s. 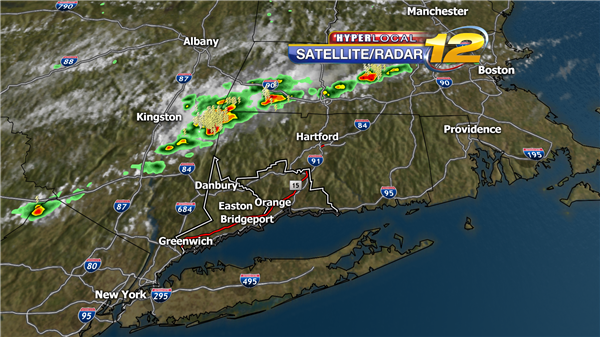 Scattered storms are moving into the NW corner of CT and will move closer to our area later tonight. 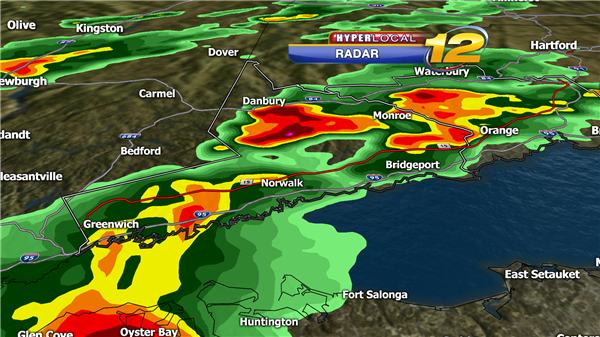 Brief heavy rain and thunder will be possible. Check out the large temperatures spread from north ot south. Greenwich is getting it's temp from Westchester Airport and probably closer to what the actual number would be for north Greenwich. The heat index adds a couple of degrees to that temperature for what it feels like. Tuesday morning on the bus stop will be nice and comfortable. It will warm up to 80s during the afternoon. It's starting to warm up with sunshine. Tune in to see changes in the forecast. 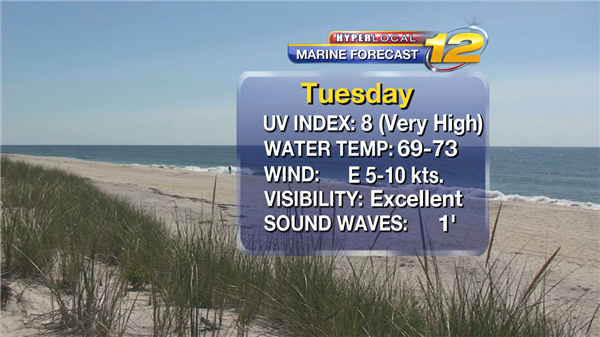 Expect high tide at about 7am and 7:30pm on Tuesday. Skies will be mostly sunny. Don't forget the sunscreen! Now that yesterday's cool front is well to the east, we are enjoying low humidity and slightly cooler than normal temperatues. High pressure to our west will keep rain away from our area at least until Thursday. Here's a look at the planner through the evening. 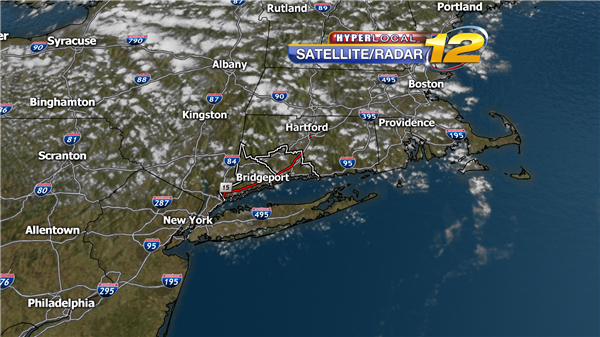 Fair weather clouds have developed this afternoon. 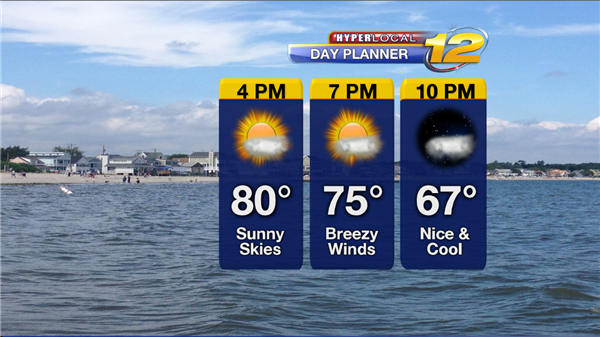 Our comfortable and mostly sunny weather continues into the evening. Tonight expect lows near 60 with clear skies. 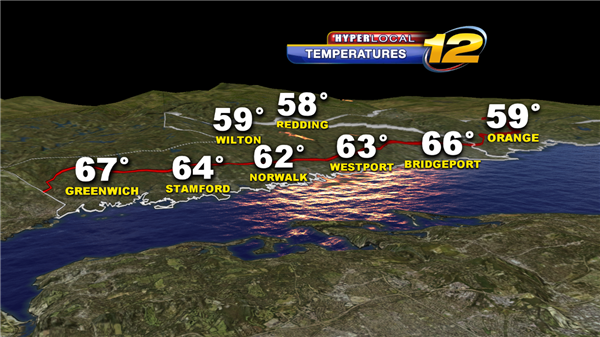 It's already in the 50s in spots! Enjoy this cool and crisp night. Nicole took this photo by the water in Milford this morning. It's such a beautiful day. There have been only three days with measured rain this month at Sikorsky Memorial Airport in Stratford. However, Wednesday's daily record rain of 1.66" pushed the monthly total to just about two inches (1.90"), which is 0.05" above normal. The average temperature this month through yesterday at Sikorsky Memorial Airport in Stratford is exactly 74 degrees, which is 0.3 degrees below normal. The highest temperature this month is 85 degrees, which happened on August 10 & 11, and the lowest is 61 degrees on August 8. 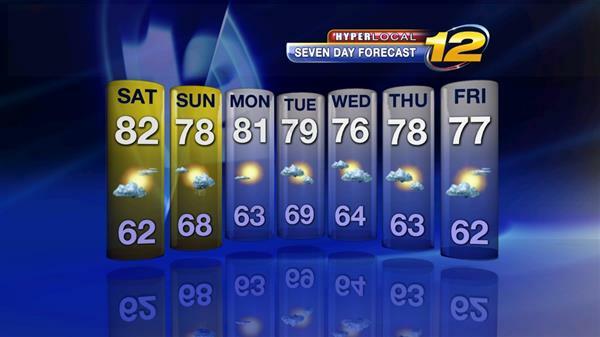 Here is a look at the updated seven-day forecast. Daytime high temperatures will hold in the 70s for much of next week. Some showers and a possible thunderstorm are expected Sunday as a front pushes through the Northeast. Here is the forecast map for Sunday morning. We'll enjoy a fabulous Friday under mostly sunny skies and high temperatures in the upper 70s, which is cooler-than-normal for mid-August. Please get outside and enjoy the day. 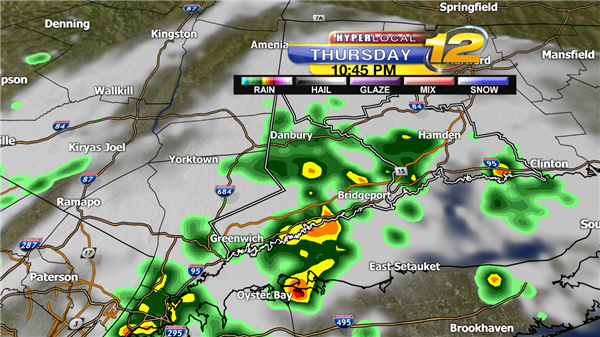 Our high resolution computer model shows a quick heavy rain moving through this evening as a weak cold front passes. Be on the lookout for more rain and we'll keep you updated right here! 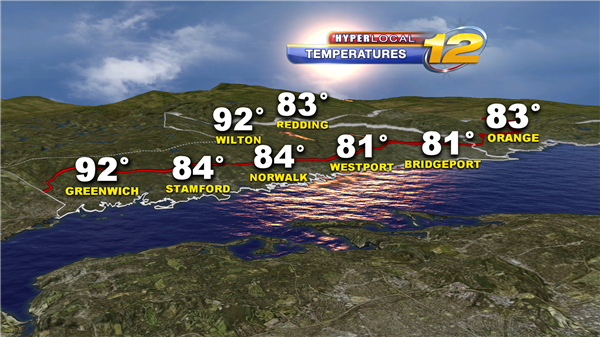 Our average high for today is 81 degrees. We are well below that with sunshine and low humidity. Winds are still breezy with gusts over 20 mph. 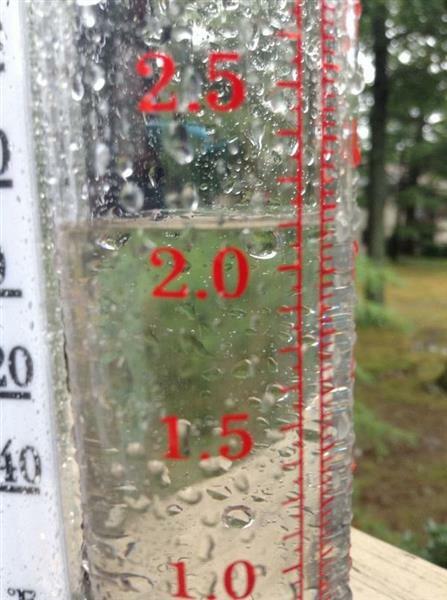 Viewer Nick Ferrando of Stratford christened his new rain gauge by measuring 2.12" this morning. Here is a photo he took of the rain gauge. 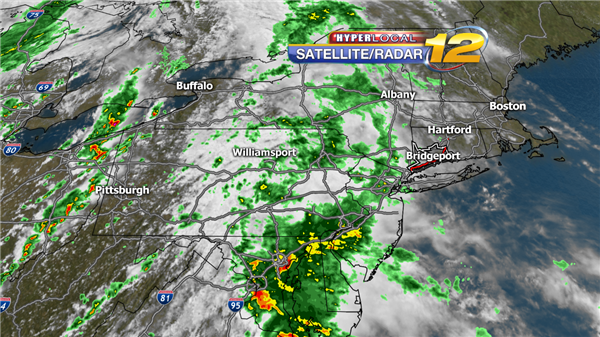 Rain is moving closer to Southwestern CT but most of the rain across the region is fairly light and scattered. The cluster of storms near D.C. will be closely watched. That's where a secondary low is expected to develop and move into our area by morning. We are still expecting 1-3 inches of rain with the potential of flash flooding. 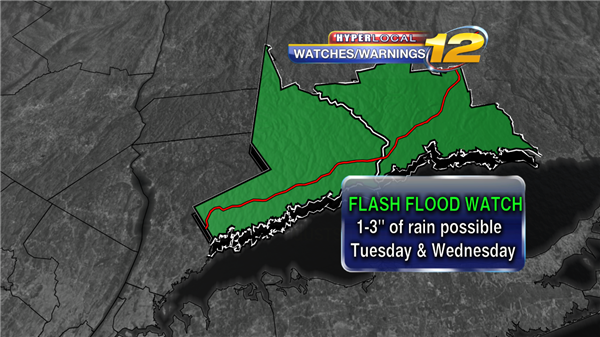 A Flash Flood Watch will be in effect from Tuesday evening until Wednesday. The weekend will be great with sunshine and low humidity. We won't see rain again until Wednesday. Until then...enjoy! 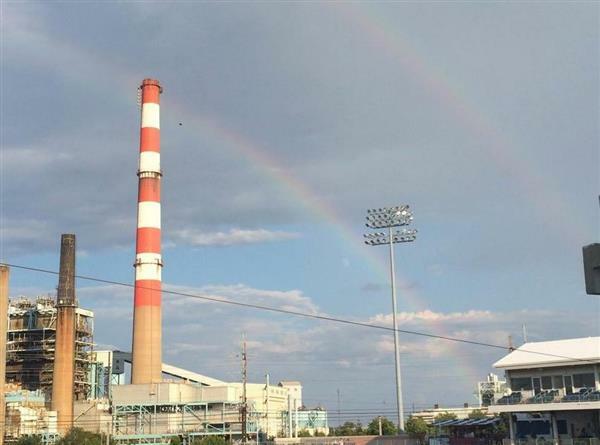 It looks like our "pot of gold" at the end of the rainbow will be this weekend's weather. This photo was taken Thursday evening at The Ballpark at Harbor Yard in Bridgeport. A spectacular weekend is ahead under mostly sunny skies and high temperatures in the lower 80s. The weekend forecast looks delightful with mostly sunny skies, seasonable temperatures, and comfortable humidity levels. 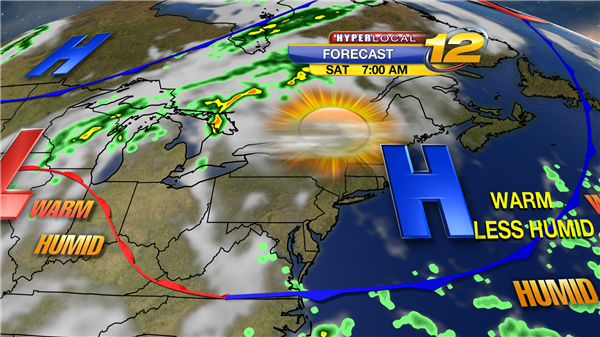 Here is the Saturday morning forecast map with high pressure located over the Northeast. 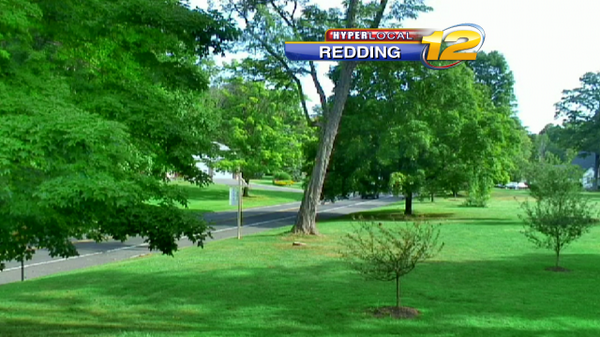 It's partly sunny, cooler, and less humid in Redding this morning. The air temperature is 68 degrees with a dew point of 61. Pleasant weather is expected tomorrow through the weekend. 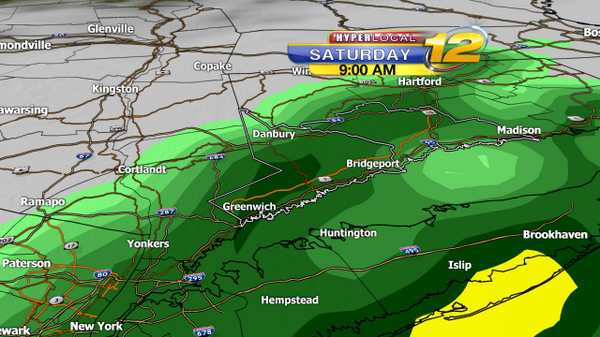 Rain is expected Saturday morning, but it should begin to taper off by midday and early afternoon. However, it will be slightly cooler with the cloud cover and a high temperature of 76 degrees. Here is Saturday's 9 a.m. forecast map. We couldn't ask for a better way to wrap up July. Sunshine, below normal temperatures, and low humidity continues today. We will slowly feel the mugginess returning tomorrow and through the weekend. Recent runs of the models bring heavier rain Saturday morning as an upper level low pressure system brings a front that will stall just to our south. With the front being nearby we'll have a daily chance of rain into the start of next week. But don't expect rain at all times! It will be scattered so you'll still have the opportunity to enjoy some time outdoors.